This was supposed to be a happy post. The Yankees got the starter they needed yesterday, sending Brandon Drury and Billy McKinney to the Blue Jays for J.A. Happ, but instead it’s a sad post. 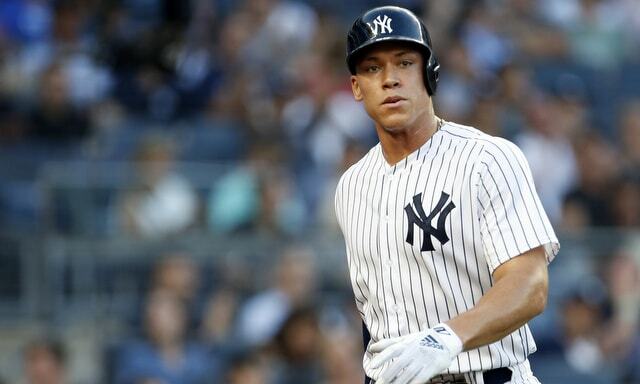 Aaron Judge will miss at least three weeks after getting hit by a pitch and suffering a chip fracture in his right wrist. It’ll be at least three weeks until he swings a bat again, so he’s really going to miss more like four or five or six weeks once you factor in rehab work and rehab games. It stinks. Anyway, let’s talk this out. 1. Really can’t overstate how devastating a loss this is even for only a few weeks. Judge is far and away the Yankees’ best player and he’s on the very short list of the best players in baseball. Judge leads the regulars in on-base percentage by nearly 50 (!) points and he’s hitting .285/.398/.548 (158 wRC+) with 26 home runs overall. Add in his standout right field defense and both versions of WAR have Judge as a top five position player in baseball. That makes him essentially irreplaceable. Given the AL East race and where the Yankees are on the win curve, every win added or subtracted has a big impact on their division title chances, and losing Judge means losing wins. Depending on his replacement, it could be as much as two or three wins lost over these next few weeks. Maybe more. Add in Gary Sanchez being down at the same time and yikes. Quite a bind the Yankees are in here, but good teams overcome adversity. I’m looking forward to seeing how this club responds. Onward. 2. In the short-term, it’s safe to assume Giancarlo Stanton will take over as the everyday right fielder with Shane Robinson sticking around as the fourth outfielder. He was called up yesterday to fill Drury’s roster spot. The Yankees only have three healthy 40-man roster position players in the minors at the moment: Tyler Austin, Ronald Torreyes, and Tyler Wade. Torreyes just returned from an extended absence because he was home with his wife, who had a medical issue. He’s currently playing in what amount to minor league rehab games in Tampa to get back into game shape. Torreyes probably isn’t a call-up candidate yet. Still some rust to shake off. If the Yankees want to bring up a pure bat to replace Judge, Austin is the way to go. Otherwise Wade is the more functional player because he can play more positions, handle them all well defensively, and run like crazy. The Yankees could also slide Jordan Montgomery onto the 60-day DL to call-up a non-40-man roster player, though I’m not sure who that would be. Mike Ford? Not great. I think the Yankees will call up Wade today and rotate guys in and out of the DH spot, with Neil Walker becoming an everyday player. Walker has gone 13-for-39 (.333) with seven walks (.426 OBP) in his last 14 games. Playing regularly while Gleyber Torres was sidelined seemed to get him on track. Now he figures to get a chance to play even more. 3. How about a trade? Always possible, and the trade deadline is four days away, so the Yankees have some time to scour the market for a bat to help out while Judge is on the mend. And the cool thing is they can look for a player at any position because Stanton will take over right field. They’re looking for a replacement DH, basically. Mike Moustakas’ name has been kicked around a bunch these last few weeks. Adam Jones? Matt Adams? Jose Martinez? Derek Dietrich? Jose Bautista? Ugh, Bautista in pinstripes would be worse than Kevin Youkilis in pinstripes. Plus the Yankees and Mets couldn’t even work out a dumb Lucas Duda or Jay Bruce trade last year. I’d bet against a Bautista trade. I have no problem with that either. What about Curtis Granderson? His numbers have dipped in recent weeks and he’s at .229/.332/.408 (104 wRC+) on the season, including .239/.338/.429 (111 wRC+) against righties. As a platoon bat who draws walks and knows how to take advantage of the short porch, I’d be down for it. Granderson is forever cool with me. There are all sorts of bats out there, potentially cheap and effective ones, and the Yankees might try to pry one loose before Tuesday’s non-waiver trade deadline. And, if they don’t, there should still be plenty of bats available on trade waivers in August. The Yankees can see how their internal options handle things the next week or two, then make a move if they need outside help. 4. Gosh, how much does it stink that Clint Frazier is on the disabled list right now? He’s out with post-concussion migraines and there’s no real timetable for his return. Clint’s been going through light workouts with Triple-A Scranton the last few days and it’s basically touch and go. Work out a bit, see how he feels. Work out a little more, see how he feels. They’ll do that and continually ramp up his rehab work as the migraines allow. Anyway, it stinks Frazier is hurt, for both Frazier and the Yankees. This could’ve been his big audition as an everyday player. The Yankees could’ve plugged Clint right into the lineup and let him run with it. Instead, he’s on the disabled list, and the Yankees have to look elsewhere. It stinks. It really does. I feel bad for Frazier because he’s been on the shuttle all season waiting for a chance to play regularly, and now that opportunity is available, but he’s not healthy. Hopefully he can come back soon and get into the lineup while Judge is out. 5. 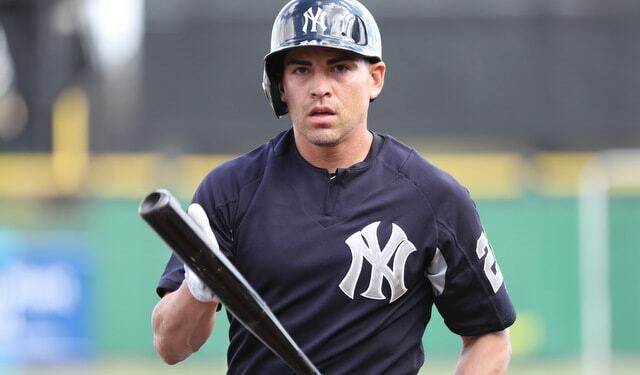 For the first time this season, I can honestly say the Yankees could use Jacoby Ellsbury right about now. Their outfield depth disappeared in a hurry. Frazier got hurt, McKinney was traded away — geez, how about the timing on the trade and Judge injury? — and now Judge is hurt. Boom boom boom, one right after the other. At the very least, a healthy Ellsbury could’ve been a platoon option off the bench. A better fourth outfielder than Robinson, basically. As far as we know Ellsbury has not yet even started baseball activities, so he’s nowhere close to returning. Heck, Judge might even beat him back at this point. The Yankees haven’t missed Ellsbury at all this season. His ridiculous string of injuries has helped the Yankees avoid an awkward roster situation. But, right now, the Yankees could really use an extra outfielder, and they’ve had an expensive yet useful outfielder sitting on sidelines all season. That’s … still kinda good? It is. Anyway, Hicks has the perfect No. 2 hitter’s skill set. He walks (13.3%), he gets on base (.347 OBP), he’ll hammer a mistake (16 homers), he doesn’t strike out excessively (19.5%), he can run (8-for-9 in steals), and he’s a switch-hitter. Pretty much the ideal No. 2 hitter. I think slotting Hicks in as the No. 2 hitter and leaving Gleyber in the middle of the lineup, in more of a run producing spot, is the way to go. If Boone goes with Torres as the No. 2 hitter and Hicks as the No. 5 hitter, that’d be okay too. Not a huge difference either way. But I think Hicks as the No. 2 hitter and Gleyber as the No. 5 hitter is the slightly better alignment. 7. Let’s talk about the Happ trade for a second because I was planning a thoughts post on that, but the Judge injury kinda took the wind out of my sails. The trade was one of those “a move they had to make” moves, in my opinion. I think Happ is a clear upgrade over Luis Cessa and Domingo German, and a good hedge against Justus Sheffield not being ready. If the Yankees deem Sheffield ready at some point, he’s going to get called up. They’ll make room for him. Your opinion of the Happ trade likely depends on your opinion of Drury. If you think he can be an above-average everyday player, it’s a good deal for the Blue Jays. If you’re not sold on Drury being that good, then it’s easy to see why the Yankees would do the deal. I’m somewhere in the middle. Drury has some ability for sure, but I’m not sure what he does well, exactly. What’s the standout tool? He’s kinda average across the board, and hey, that’s fine. That skill set will keep you in the league a long time. Clearly things did not work out as Drury or the Yankees hoped. Andujar took his job pretty darn quickly and, as they’ve been doing the last few years, the Yankees committed to the young player. Easy decision there. Drury became expendable and there’s a pretty good chance Happ will go down as the best pitcher traded at the deadline, so the Yankees used Drury to get him. They dealt from positions of depth (well, at least before Judge got hurt) to address a weakness. 8. Even after the Happ trade and before the Judge injury, I didn’t think the Yankees were completely done with their trade deadline activity. I mean, it’s possible they won’t any more trades, but I don’t think they’re going to stop looking. They figure to keep an eye out for a bat now that Judge is hurt, and I think they’ll absolutely monitor the pitching market in case a controllable high-end starter becomes available, like Jacob deGrom or Marcus Stroman. Happ shouldn’t stop them from pursuing someone like that. Also, the Yankees are going to look for a catcher. They kinda have to, right? Brian Cashman said Sanchez could be out until September. Another backstop to either stash in Triple-A or carry on the MLB roster with Kyle Higashioka going back to Triple-A would be a-okay with me. Devin Mesoraco and Wilson Ramos are the big names out there. One guy I’d keep on eye on: A.J. Ellis. He’s backing up Austin Hedges with the Padres and, in addition to be a good defender and having a reputation for working well with pitchers (he was Clayton Kershaw’s personal catcher for several years), he’s hitting .286/.391/.357 (114 wRC+) this year. I wouldn’t expect him to continue hitting that well, but Ellis is a career .239/.340/.353 (96 wRC+) hitter, and that’s pretty darn good for a guy you’re looking at as a backup. The “better than Higashioka” bar is quite low, remember. The Padres have top catching prospect Francisco Mejia as well as up-and-down journeyman Raffy Lopez in Triple-A, so Ellis should be expendable. Could be a cheap upgrade over Higashioka and give the Yankees a little extra catching depth while Sanchez is on the disabled list.